Postgraduate entrants can apply only once in the course of their degree and with one piece of work. The SIS Postgraduate Prize aims to raise the profile of Italian Studies at British and Irish Universities and to reward the excellent research being carried out in the discipline. The competition is open to postgraduates (MA, MRes, MPhil, PhD) in Italian Studies who submitted their dissertation/thesis the calendar year before, and passed the viva (even if with corrections) by the time of the application. Two prizes are available: 1 prize of £100 for taught MAs dissertations and 1 prize of £200 for MRes/MPhil/PhD theses. i. Taught MA candidates should submit their dissertation as a pdf file, with word count, up to 15,000 words in length. ii. MRes/MPhil/PhD candidates should submit two pdf files. One will contain the title of the thesis, list of content, a short abstract (max. two A4 pages) detailing the context and methodology of the thesis, and the bibliography. The other file will present a piece of work (typically a chapter) of no more than 15,000 words in length, with word count. In both cases, the submitted piece/s of work must be completed (not in draft form), unpublished, and not be under consideration for publication. The subject matter will be confined to the humanities and social sciences relating to Italy, from the Middle Ages to the present day. Work may be submitted in English or Italian. Submissions are made by the supervisor, and not directly by the author, and must be accompanied by a covering email confirming the degree for which the author was registered and when they completed it. We cannot accept entries without the covering email, nor resubmissions. The judging panel will be made up of members of the SIS Executive Committee. The deadline for submissions to the next SIS Postgraduate Prize will be 1 April 2020 for work submitted in 2019. · Rachele Bezzini (Univ. of Sussex), with a PhD in Migration Studies on ‘Boundary-making in an immigrant social space: Albanian-Italian and Albanian-Romanian couples in Italy’. The Society created the biennial British Italian Society Prize in 2002 to encourage the study of Italian language and culture at British and Irish universities both at undergraduate and postgraduate level. Each University/Institution is invited to submit ONE candidate under (a), (b) or both, following a pre-selection process, conducted in each case by the Italian Department (or equivalent) in consultation with their colleagues in Italian Studies or in other departments as appropriate. The work must be submitted by the candidate’s supervisor or tutor. All work must have been submitted and passed during the academic year just finished, and postgraduate students must have passed the viva (even if with corrections) by the time of the application. Undergraduates submit a final year essay (up to 5,000 words) or dissertation (up to 10,000 words). Taught MA candidates should submit their dissertation as a pdf file, with word count, up to 15,000 words in length. MRes/MPhil/PhD candidates should submit two pdf files. One will contain the title of the thesis, list of content, a short abstract (max. two A4 pages) detailing the context and methodology of the thesis, and the bibliography. The other file will present a piece of work (typically a chapter) of no more than 15,000 words in length, with word count. Work may be submitted in English or Italian. Submissions are made by the supervisor, and not directly by the author, and must be accompanied by a covering email confirming the degree for which the author was registered and when they completed it. We cannot accept entries without the covering email, nor resubmissions. A panel of judges drawn from both the BIS and the SIS executive committees will deliberate with a view to announcing and presenting the awards in the spring of 2020. All essays, together with the relevant supervisor’s supporting email, must be submitted by the supervisor by 15th July 2019 to the Society for Italian Studies Prize Coordinator, Dr Marina Spunta, at m.spunta@le.ac.uk. For the Rooke Prize for Undergraduates: Lucia Crowther of the University of Reading for her dissertation on ‘The Architectural Formalisation of Pilgrimage in the Portico of the Madonna di San Luca’. The runners-up on the UG category were Melanie Sackett (Exeter) and Isabel Orange (Bristol). For the Rooke Prize for Postgraduates: Marianna Griffini of the LSE for her work on ‘Colonial Hybridity in the Italian Community in Libya (1926-1970)’. Runners-up in the PG category were Kate Willman (Warwick) and Stefano Bragato (Reading). 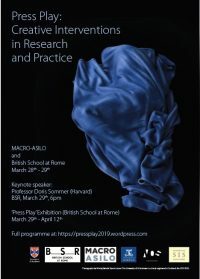 This fund is designed to support Postgraduate students by facilitating their attendance at UK and ROI conferences which are not directly funded by the Society for Italian Studies (i.e. bursaries are not available for the SIS Biennial or Interim Conferences). Bursaries are normally available for students giving a conference paper, but individual circumstances will be considered. In order to be eligible for a bursary, students must also apply to their home institution for funding and must have the support of their Head of Department. Please note that the requested amount for a bursary should not normally exceed £100. All applicants must be members of the Society for Italian Studies. Postgraduate students wishing to apply for a bursary are required to submit their application form (MS Word/ PDF) to to the Research Officer, Dr Emma Bond (efb@st-andrews.ac.uk) by one of two deadlines each year: 15 December and 15 June.